Bhindi or Okra is one of my favourite vegetables. 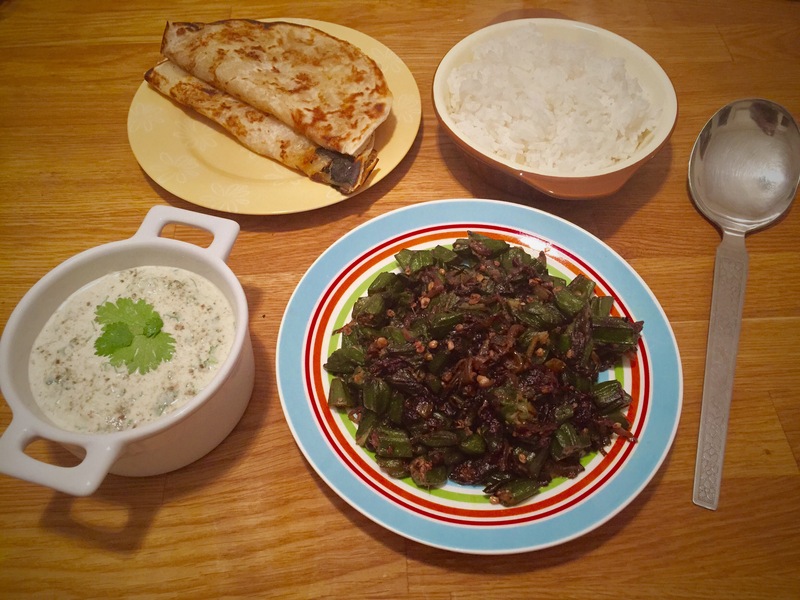 Each time I go back home to India, bhindi has to be on the menu for my arrival celebratory dinner. Also known as ladyfinger, Okra is used across a wide variety of cuisines – Indian, Middle Eastern, Southern American to name a few. Yet I find this lip smackingly delicious vegetable is not celebrated like it should and remains the unsung hero of the vegetable kingdom. 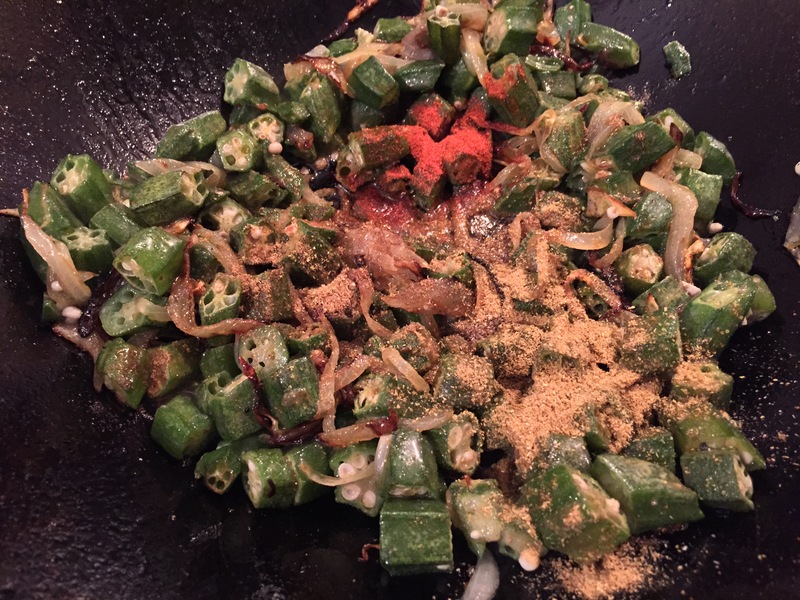 There are various ways in which Okra can be prepared – you can make an okra curry, deep fry it to make crispy okra, and many more. 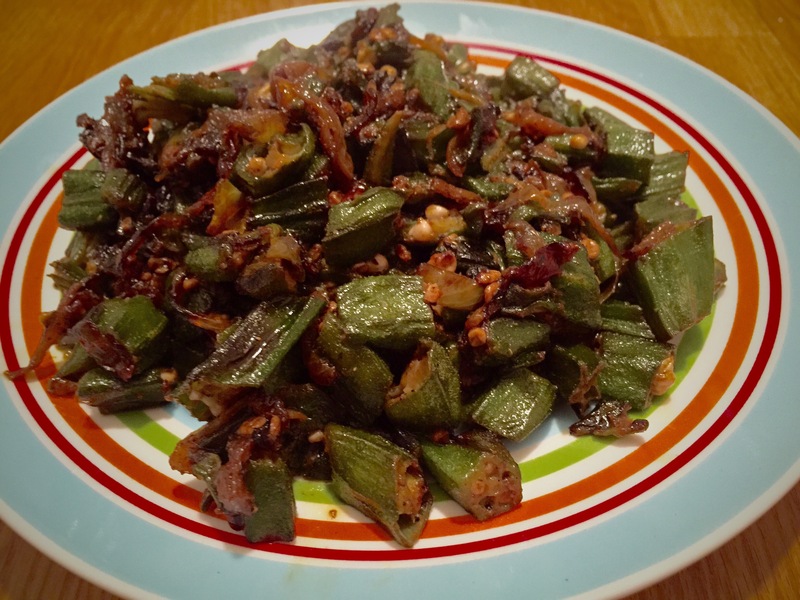 However our family favourite is definitely Bhindi do Pyaza. Okra cooked with caramelised onions and dried spices, the flavours are just divine. I remember as a child when we would go visit my Beeji and Massi in Shimla (a beautiful hill station in the lap of the Himalayas, north of India), my Mum would always make bhindi and tamatar waale jeera aloo with savoury parathas for our overnight train journey. Meal times on the train were so exciting. I vividly remember my Mum would buy my brother and I tomato soup to start with. You will know of this legendary tomato soup if you have taken an overnight train from Bombay to Delhi. After the soup followed a lavish meal, my Mum would open up that big stainless steel tiffin and in each container were lip smackingly delicious treats. Of course I was the happiest when there was Bhindi on the menu. Wash the okra under running water. Prior to chopping it thoroughly wipe it with a kitchen napkin and ensure its dry. This prevents the okra from getting slimy while cooking. Chop the okra into half-inch pieces. In a pan or wok heat mustard oil, it gives the dish that delicious earthy flavour. However you can use vegetable oil or olive oil too. 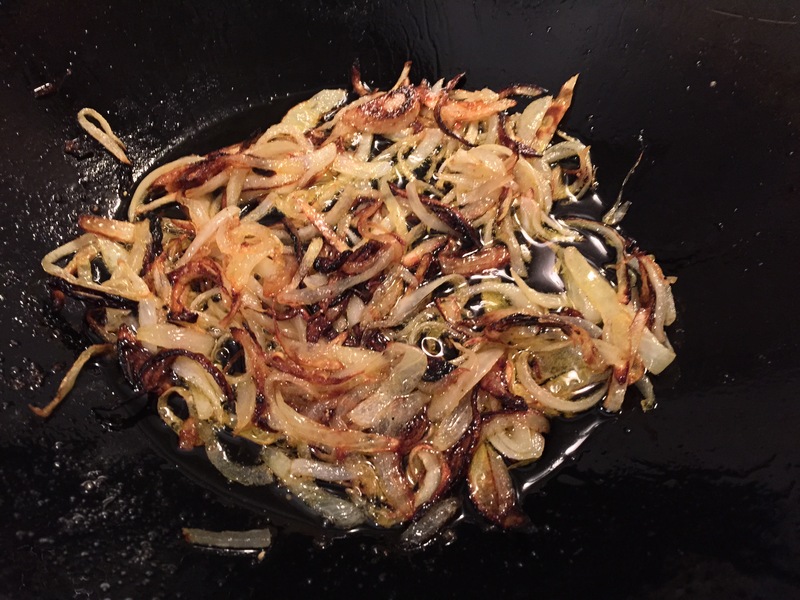 Add the sliced onions and slow cook them on a low to medium heat for seven to ten minutes or until slightly caramelised. Now add the chopped okra, followed by all the dried spices except Amchur powder and salt. Toss the okra and ensure the spices are evenly mixed through. Cook the okra on a medium heat until okra is tender. Finally add Amchur powder and season with salt as desired. If you don’t have Amchur powder you can replace it with one tablespoon of lemon juice. Toss the okra once more prior to serving. Your lip smackingly delicious Bhindi do Pyaza is ready to serve. Remember you can serve it as a side dish or a main dish as I have along with savoury parathas, cucumber raita and rice. Ps: If my Mums train tiffin interested you at all, please find the tamatar waale jeera aloo recipe here and savoury paratha recipe here. Enjoy!! looks so good! I love that it’s Okra! not many recipes with Okra! nice story! !